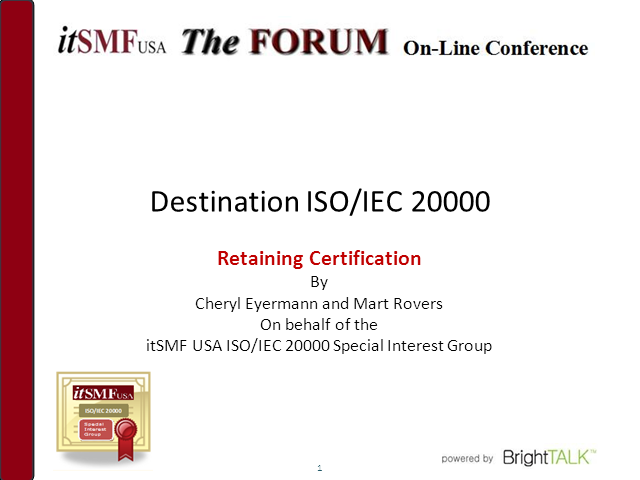 This last webinar in the series of “Destination ISO/IEC 20000” addresses how to retain your ISO/IEC 20000 certificate after your organization has been certified. Management reviews, internal audits, surveillance audits and continual service improvements are in the spotlight of this presentation. Presented by Cheryl Eyermann, Lead Mission Operations & Services at Raytheon Company and Mart Rovers, President of InterProm USA Corporation.